We have all been saying that Lewis Hamilton's perfect season must be broken sooner or later by some bad luck and so it proved in Q3 today; something broke in the McLaren's right front suspension and the tire deflated instantly, sending the car nose first across the gravel and into the tire barriers. Hamilton was slow to get out of the car and was stretchered away but it seems that this was precautionary only and he should be fit for the race tomorrow. 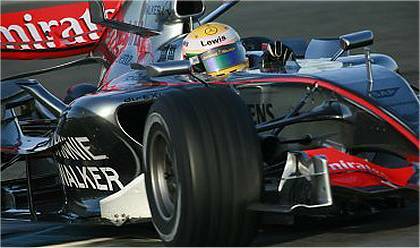 Qualifying was red flagged while the McLaren was removed and, when the cars came out again, the rookie slipped inevitably down the time sheet to end up in tenth spot on the grid. The race should give us the chance to see how Hamilton's GP2 overtaking skills translate to F1, therefore; he will have to deal with the Toyotas, a Renault (Kovalainen's) and a Red Bull (Mark Webber's) before getting to grips with even the BMWs that have so often this season been the sticking point for any of the big boys recovering from a bad qualifying session. And the BMWs are very close to the two top teams at the Nurburgring, Kubica beating Massa to 4th fastest in P4 this morning and Heidfeld less than a tenth away from Massa's third spot in qualifying. It cannot be long before they grab a race win, surely. Pole position still came down to the fight between the remaining top three, however. Raikkonen confirmed his return to form by claiming it for Ferrari but Alonso's McLaren might well have had the beating of him had not the Spaniard ruined his best lap with a big mistake in the second sector. His first and second sectors were the best of the session, however, and the lap was still good enough to grab second on the grid. Massa never managed to put all of his quick sectors together in Q3 and had to be content with third. Until then he had looked very quick, however, and will be a factor in the race. Once again it was Webber who demonstrated the potential of Adrian Newey's design, putting the Red Bull into sixth and making us shake our heads at David Coulthard's qualifying bogey; the Scot had been right with Webber throughout practice but then failed to make it past Q1. Neither of the Toro Rossos made it through to Q2 either. Renault's ambition to compete with BMW took another bashing at this circuit, only Kovalainen making it into the final session of qualifying and ending up 7th, while Fisichella could do no better than 13th. And what can I say of the Toyotas? They were good enough to make it to Q3 but, on the strength of previous races, one must wonder how long their 8th (Trulli) and 9th (Ralf) spots will last in the race. For Williams, Wurz has shaken off his poor qualifying form and was only two hundredths away from his team mate Rosberg's time - but it was not enough to get into Q3; they were the best of the rest in 11th and 12th. Behind them, the Hondas continued to struggle and seem unable to break away from their junior team, Super Aguri, and Spyker did their usual sterling job of bringing up the rear. For the race we can expect a battle royal between the Ferraris and Alonso's McLaren while no doubt Hamilton will make up several places in the opening laps. Raikkonen looks very strong on this circuit but I suspect that the McLaren is marginally quicker this time out - keep your eyes on Alonso tomorrow.